Yesterday Lisa and I went to finally watch the last Harry Potter movie - Harry Potter and the Deathly Hallows Part 2. 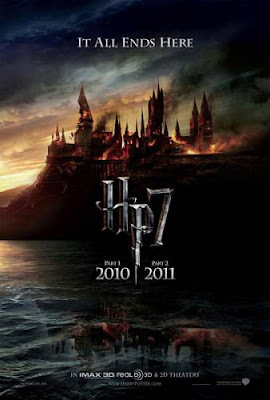 It is the second part of the seventh movie and Harry's last adventure. He, Hermine and Ron started to hunt Horcruxes already in the first part of the seventh movie and now they attempt to finish this incredibly difficult task. They have of course a lot of help, as they return to Hogwarts and have all their friends with them to fight against the Deatheaters and Voldemort. After a long and unnerving battle they manage to find and destroy the last Horcruxes - and also Harry has to die, as he is one of the Horcruxes.. Then they kill Voldemort. Finally! Well, we really really really liked the movie, it was great!! There were emotions, action, love, death, a lot of goosebumps and also some tears. We think David Yates, the director, made it a terrific movie. It is an unforgettable experience for young and old. The film was mostly identical with the book and all important scenes were in it. We also liked the soundtrack very much, it catches the atmosphere of the movie perfectly. I still get goosebumps when watching those trailers! I'm Michelle from Bloomberg News and since you like Harry Potter so much, I thought you might be interested in our Game Changers special tonight on J.K. Rowling and the Harry Potter Series. It's on at 9 pm ET/PT on TV http://bloom.bg/mQS1vY or on the web http://bloom.bg/llKG3I.